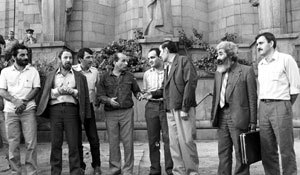 The Karabakh Committee, including the future first president of independent Armenia, Levon Ter Petrosian (third from right) helped raise “the Karabakh Question”..
Few of the one million people who massed in the streets of Yerevan in those early heady days of demonstrations would have predicted that Armenia would have a Karabakhi as head of state within a decade and another as defense minister. Fewer still might have believed that the “Karabakh Question” would remain unsolved in the international arena. That question is settled in the minds of the men and women on the street, who have paid a terrible price in blood and endured massive economic sacrifice to secure military victory and Artsakh’s independent status. But it remains open to interpretation in the arena of international politics and there are many signs that 2004 will see a marked increase in the pressure for a final settlement. President Robert Kocharian occupies a unique position. His political authority as a wartime leader and former President of Karabakh is viewed by many as a guarantee that he won’t make concessions that undermine Stepanakert’s de facto independence. Conversely, he is seen as someone who can sell possibly painful concessions to the Armenian public, in Armenia, Karabakh and further afield, precisely because of his political authority. He runs the risk of being damned if he does, therefore, and damned if he doesn’t. The suggestion of compromise with Azerbaijan was enough to force former president Levon Ter Petrosian from office in 1998, partly at the hands of Kocharian, whom he had brought to Yerevan as Prime Minister. Kocharian does not forget that he owes his present position to negative public reaction and that he may lose it the same way. That political crisis exposed a philosophical divide at the top of the Armenian leadership. The Ter Petrosian faction considered a settlement to the conflict an essential precondition of economic recovery for Armenia, burdened by the impact of the blockade and the cost of sustaining the defense of Karabakh, and that it could be achieved through a step-by-step process of confidence-building measures. Kocharian represented the view that a stronger Armenian economy was possible without a settlement and would improve the prospects of achieving one through an all-embracing package deal. The latter policy has dominated for five years now and Armenia’s economy has certainly improved, recording the fastest growth of any former Soviet republic in 2003. This year will likely put Kocharian’s argument to the test: Has his hand been strengthened in striking a deal - or perhaps resisting one - with Azerbaijan under the auspices of the international mediators in the Minsk Group of the Organization for Security and Cooperation in Europe (OSCE)? Or has pursuit of a “package” solution over step-by-step measures weakened Armenia’s bargaining position through delay? 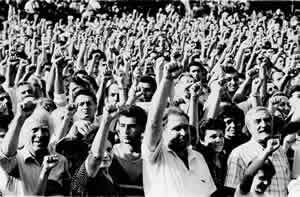 Shouts of “Kar-a-bakh!” filled Opera Square in Yerevan in 1990. There are no shouts now for peace, but plenty hopes..
About the only thing that unites the different elements of the divided political landscape in Yerevan is the view that a settlement must incorporate one of these two objectives. The gray area is what may be conceded to achieve it and whether it is achievable at all in the face of Azerbaijan’s repeated refusal to entertain any solution that does not leave Karabakh under Baku’s jurisdiction. The position of the government in Stepanakert is clear: Karabakh must either be independent or reunited with Armenia. One of the ironies of Kocharian’s elevation in Yerevan, however, has been Karabakh’s relegation from any involvement in talks on its future status. Armenia used to argue that the issue was best addressed by dialogue between Artsakh and Azerbaijan, in which it was the guarantor of Karabakh’s security. Kocharian, however, has taken upon himself the responsibility of representing the position of both Karabakh and Armenia, dropping any pretence that the two may be separate. In many ways this is only common sense (though diplomatically it may cause problems). Stepanakert remains entirely dependent on Yerevan for financial support, defense, encouragement of inward investment, and transport links to the wider world. It could not support anything at odds with Armenia’s view of the conflict, even assuming there were circumstances in which it would wish to. Drive the road from Yerevan to Stepanakert – the Artsakh section built with money raised in the Diaspora – and the two already feel as one. Nothing any longer defines the strip of land between Armenia and Artsakh as Azeri territory, while only a road sign and a traffic police post mark the passage into Nagorno Karabakh Republic, as if you were driving from one region of Armenia into another. Kocharian has made plain that a final settlement must include a common border between Armenia and Artsakh and it is inconceivable that it could be any other way now. The land between the two is being populated with Armenian families, creating facts on the ground that the Minsk Group mediators will find impossible to ignore. The secrecy that envelopes the negotiating process, however, makes it almost impossible to divine the shape of the settlement being put together by the mediators. Kocharian and the late Heidar Aliev were believed to have achieved the outline of a deal at the Key West summit hosted by Secretary of State Colin Powell in 2001, only for it to break down after the latter baulked at selling it to his public. With power now passed to Aliev’s son Ilham as president, the question is whether discussions pick up where they left off or whether the new Aliev has a different perspective on the future shape of a deal. Kocharian’s meeting with him in Geneva late last year was little more than an opportunity to look his opponent in the eye to see what measure of a man he was dealing with. The hard bargaining remains and always with the risk that the outcome may be derailed by negative public reaction in either country once the details are revealed. In that regard, Kocharian’s recent offer to put any proposals to a referendum can be viewed in two lights. Approval by the public narrows the scope for being ousted by hardliners in the manner of Ter Petrosian. Kocharian also knows that public rejection in a vote offers him an escape route from international pressure to agree to an unsatisfactory deal involving, for example, an exchange of territory involving the southern Meghri region. Two issues could break the deadlock. One, inevitably, is oil. Construction of the pipeline from Baku to Ceyhan in Turkey is well advanced and oil is expected to start flowing by the middle of next year. Azerbaijan is on the brink of a boom in which it expects to earn some $20 billion in oil revenues over the next two decades. For comparison, Armenia’s total state budget this year is about $480 million. 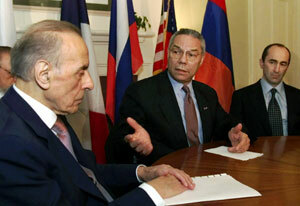 In Key West in 2001, US Secretary of State Colin Powell mediated talks between the Azeri president and the Armenian president. There was no place at the table for the president of Karabakh.. It does not follow, as some commentators insist, that a newly wealthy Azerbaijan will rearm for the specific purpose of launching a war of “liberation” over Karabakh. Desperate people fight because they have nothing to lose. The more comfortable life becomes in Baku, the less likely its young men will be willing to exchange the pleasures of a consumer life for the prospect of a painful death in a land most will never have seen. Far from fueling conflict, oil may give Azerbaijan a reason to avoid war and an incentive to seek a deal with Armenia. Azeri prosperity, therefore, may become a security goal for Armenia and certainly a bargaining chip in securing a settlement that allows Baku to enjoy the fruits of its good fortune while giving Karabakh effective independence. The second issue relates to Kocharian’s changed status. With the senior Aliev’s death and the sudden demise of Eduard Shevardnadze in Georgia’s “rose revolution”, Armenia’s president has gone from junior head of state to elder statesman of the Caucasus. Georgia’s new young president Mikhail Saakashvili has already expressed a determination to build closer ties with Armenia. Separatist movements in different parts of Georgia present him with considerable challenges in holding his country together. It may be that Kocharian can achieve a permanent solution to the Karabakh issue by enlarging the context to include a broader common view of Caucasus stability. All three countries in the region have an interest in avoiding war and promoting prosperity, yet each is locked into narrow ethnic conflicts whose resolution appear to demand a winner and a loser. Seeking common approaches to securing minority rights may permit them to escape the traps of a Soviet landscape that was never designed to serve their interests. erhaps his seniority would give Kocharian an opportunity to take just such an initiative. Now into his second term, he knows that history’s judgement of him will be shaped by his ability to settle the Karabakh Question, the issue that formed him as a man and that brought him to the presidency. He feels the pressure of time. It remains to be seen whether 2004 will provide the opportunity for him to seize the moment.